After the holidays' repeated culinary excesses, my mouth, stomach, and soul are all screeching for something quite simple and healthful. This lentil soup always fits the bill. I'm not sure if it's the folic acid-loaded lentils or the fresh, cleansing flavor of the parsley that does it for me, but whatever it is, I'm hooked. The recipe is based on one from my favorite cookbook, Alice Waters' Vegetables, and was first introduced to me one winter night in Virginia by my mother-in-law. Judy presented the lentil soup in beautiful earthenware bowls that somehow made it seem that much tastier, and served it up with a fresh green salad, thick slices of olive bread, and a lovely bright Italian red wine. As soups go, it somehow manages to be both rustic and refined with the tiny French green lentils and the small dice of the carrots and onions. I find it eminently satisfying and always make enough for several days of leftovers. A word on lentils: the soup calls for a combo of brown and red lentils, but Judy used green Le Puy, and that -- with a few other changes to the original recipe -- is how I've continued to make it. 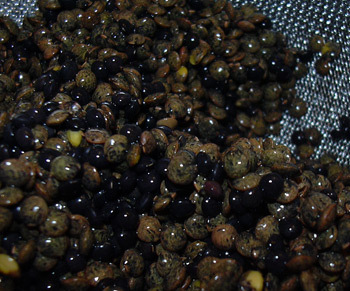 (Sometimes I add the tiny black beluga lentils to the green just to vary colors, sizes, and textures.) In my experience, the very best green Le Puy and black Beluga lentils can be found under the brand name of Cassoulets USA. They come from Twin Falls, Idaho and cook up far more evenly and firmly than any other brand of green Le Puy lentils I've found in high-end grocery stores. 1. In a soup pot over medium heat, sauté the onion and carrot in olive oil until the onions are gilded and translucent, about 1-2 minutes. Add salt and pepper to taste. 2. Wrap the parsley stems, 1/2 garlic head, and chili in cheesecloth and add it to the pot. Add the lentils and water and bring to a boil. Simmer until the lentils are tender, but not mushy, about 45 minutes. 3. Meanwhile, toast the cumin, fennel, and grains of paradise in a dry skillet over low heat until fragrant. Crush the toasted spiced with a mortar and pestle, or by using the bottom of a heavy skillet. Chop the parsley leaves. 4. When the lentils are done simmering, remove the cheesecloth and add the crushed spices and minced garlic. Taste for seasoning, add lemon juice, chopped parsley, and additional salt and pepper, if necessary. 5. Serve soup in bowls with a dribble of olive oil.